When Queen Elizabeth II was crowned in 1953, Singapore was still a British Colony and under the rule of the British Government. During her reign the political status of Singapore changed from a British-governed ‘Colony of Singapore’ to a self-governing ‘State of Singapore’ in 1959, and then to a fully-independent ‘Republic of Singapore’ in 1965. These changes in status are reflected in the wordings of the stamps here. 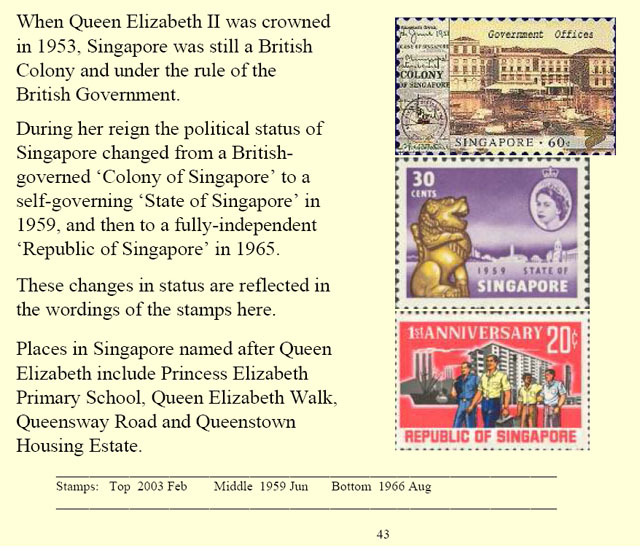 Places in Singapore named after Queen Elizabeth include Princess Elizabeth Primary School, Queen Elizabeth Walk, Queensway Road and Queenstown Housing Estate.